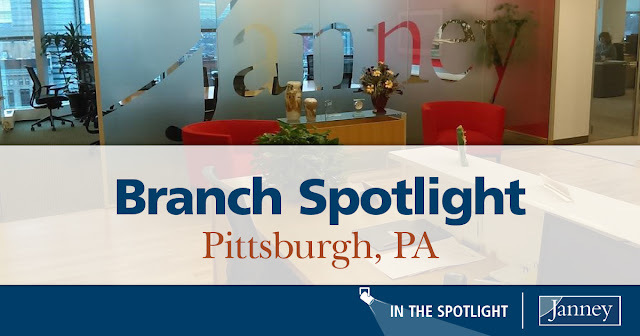 Janney’s Pittsburgh branch has had a successful year thus far. From welcoming new hires in 2017 to receiving the Pittsburgh Business Times' “Coolest Offices” award, the branch has been busy. Under the leadership of Jim Foley, CFP®, Senior Vice President/ Complex Manager, the Pittsburgh branch has also made being a good corporate citizen part of their everyday lives. With the help of PCA Sandy Zolkowski, Jim and the rest of his team choose an annual philanthropic campaign that is meaningful to the branch’s employees. For the past few years, the group has nominated Jamie’s Dream Team as their local charity of choice. Jamie’s Dream Team was created in 2005 to provide assistance to individuals who are handicapped, disabled, terminally ill, severely injured or suffering from a serious medical condition, disease or trauma. The non-profit organization’s goal is to offer hope and ease the burden caused by the recipients’ challenges or illness. The Pittsburgh branch showed their support of this meaningful organization by hosting several fundraisers and events this year. In October, they helped raised funding to ensure that volunteer firefighter, Matthew Kelsey, had the wedding that he had always dreamt of. After selflessly serving others as a firefighter and battling cancer, it was his turn to be on the receiving end of a helping hand. With the help of Janney, Jamie’s Dream Team was also able to secure funding for a big trip to Walt Disney World. Jamie’s Dream Team and other contributors flew eight children and their families on a private jet to Disney because their conditions and compromised immune systems would not allow them to fly on commercial airlines. And for the upcoming holidays, the Pittsburgh branch is raising money to purchase gifts for a Santa Claus party that they host each year. The Christmas party is open to any family that Jamie’s Dream Team has helped during the year or anyone who approaches the organization for help during the holidays. This event is a special celebration to put smiles on the faces of children who have been faced with significant challenges. In addition to the Pittsburgh branch joining together to give back to its local community, team members have also stepped up individually to make a difference. Financial Advisor Conor McKenzie, a highly decorated Marine Captain with two tours in Iraq, recently joined the board of an organization that is close to his heart - It’s About the Warrior Foundation. Conor will provide oversight to this organization that benefits veterans through its numerous financial and emotional resources. The foundation believes that with the right support, veterans can overcome the challenges of post war trauma. Sean Gilberti, First Vice President/ Investments, gave back to the community this year through fundraising for the American Cancer Society’s Real Men Wear Pink campaign, which raises research dollars for breast cancer. To support this worthy cause, Gilberti hosted a fundraiser that helped bring in almost $8,000. Sean said, “Real Men Wear Pink is a national campaign with more than 200 cities and counties participating. It’s fun and there is a healthy sense of competition. Everyone wants to help raise funding for research, but they also want their city to win.” Pittsburgh placed second in the country and raised a total of close to $180,000. Thank you Jim and the entire Pittsburgh office for your efforts to give back.